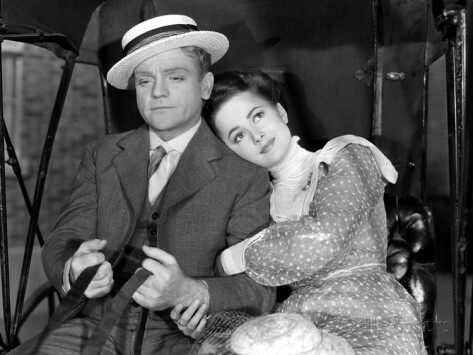 Far from it as James Cagney recounts his early days and how he met and married Olivia de Havilland in this wonderfully delightful Warner Brother’s title that I number among my personal favorites of the era. Cagney stars as the hot tempered dentist Biff Grimes who “One Sunday Afternoon” recalls his early years and courtship of two beautiful women to Warner’s studio regular George Tobias. It’s the tune The Band Played On that gets him fired up as does George Reeves playing a cocky student that leads him to reminisce about his younger days. 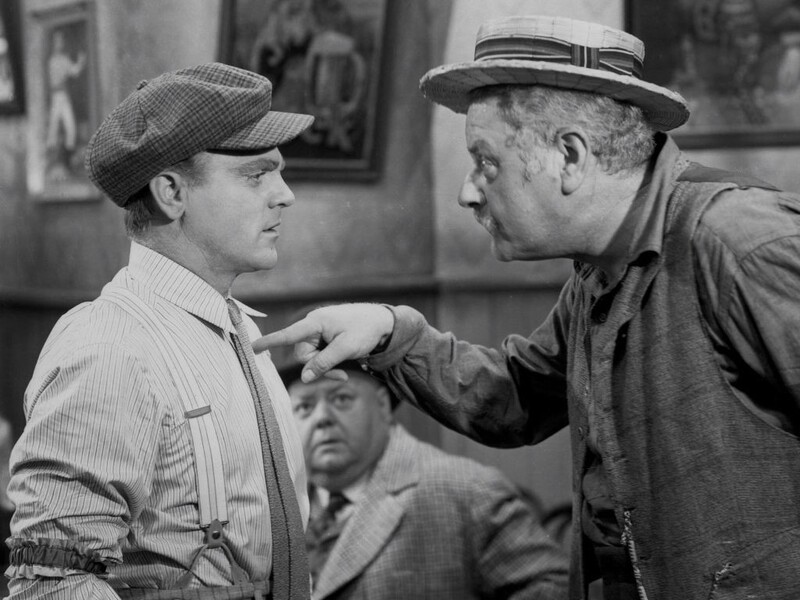 Our flashback begins with the comical presence of Alan Hale as Cagney’s Dad. He’s a flirt with the neighbourhood ladies and a regular in the bars with no money to his name. Just the gift of gab. Cagney even winds up as a bouncer in one of the saloons where he’s told to throw Hale out. “I’m supposed to be a tough guy,” he whispers to Hale. You just have to love that line coming from Cagney. Young Cagney is about to have three individuals enter his life with a major impact on his future. 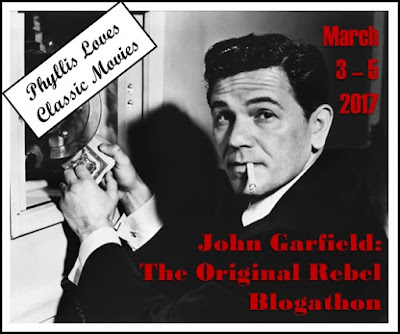 First up is smooth talking salesman Jack Carson who knows a pigeon when he see one and Cagney is ripe for plucking. It’s while hanging out at the barbershop that they meet when at the same time the men all rush out on to the street to see The Strawberry Blonde walk by. It’s gorgeous Rita Hayworth. The girl the men all covet and whistle at as she takes her “unintentional” stroll past the shop windows. All except Cagney. Rita takes notice of the cat calls and loves every minute of it though never letting on. 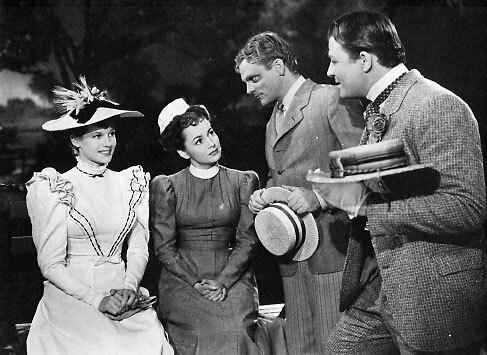 Cagney finds himself dragged along by Carson to the park where they will “accidently” meet Hayworth and her girl friend. Hence the crow comment from Cagney when he finds out he gets the other girl. He may not take an instant liking to Olivia but her entrance as a free spirited thinking woman in the 1890’s is pure joy. 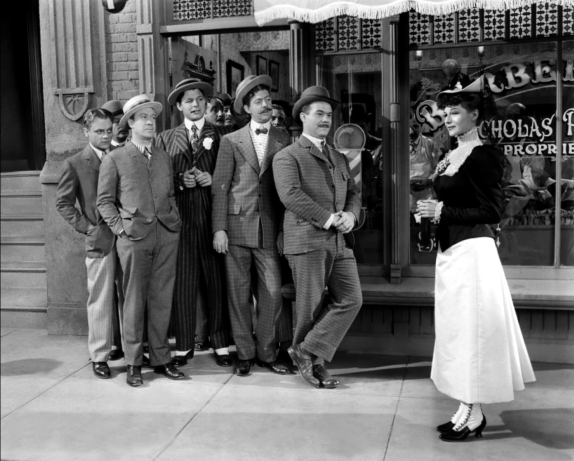 She winks at the boys and even attempts to get a cigarette from Cagney. He’s appalled and would much rather be flirting with Rita. 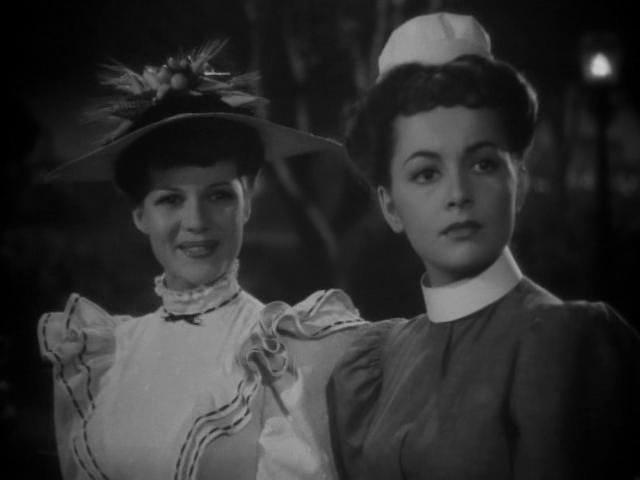 Cagney is of course blinded by Rita’s beauty and can’t see the gold digger beneath the surface. Rita winds up jilting him and running off with the sure fire Carson who is on his way to business success. By chance Cagney settles on Olivia and little does he know at this point he’s made the right decision. Fast forward eighteen months and the young couple are married. Cagney is on the verge of becoming a dentist when who should come back into his life? Carson and The Strawberry Blonde. Carson needs a sucker in a shady business venture and sadly will leave Cagney holding the bag. Get ready to reach for the tissue when Cagney goes peaceably with law enforcement as Olivia slowly comes to realize what’s really happening and breaks down sobbing. Cagney is truly a lucky man and he knows it. This has always been one of my favorite Cagney films and by extension Olivia’s as well. 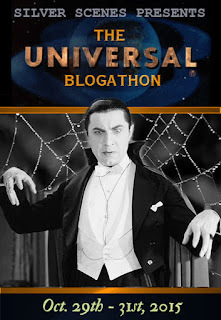 The script allows the hot tempered Cagney trait to surface that paying crowds of the day loved but at the same time it’s a comical role with a sentimental flavor through the entire running time. Olivia once again captures the essence of the girl next door. She’s the diamond in the rough that shines bright but less so when standing next to the glamorous Rita decked out in Orry-Kelly designs. By the time the final reel unwinds it’s Olivia who will indeed shine the brightest. Seeing Rita and Olivia side by side practically begs the question, “Ginger or Mary Anne” that men have been asked for the last few decades. Well known director Raoul Walsh gives us a melancholy feel to life in the big city of 1890 where music reigned and barbershop quartets can be heard on any street corner. There’s an innocence to this script from the Epstein brothers that surely is impossible not to like. 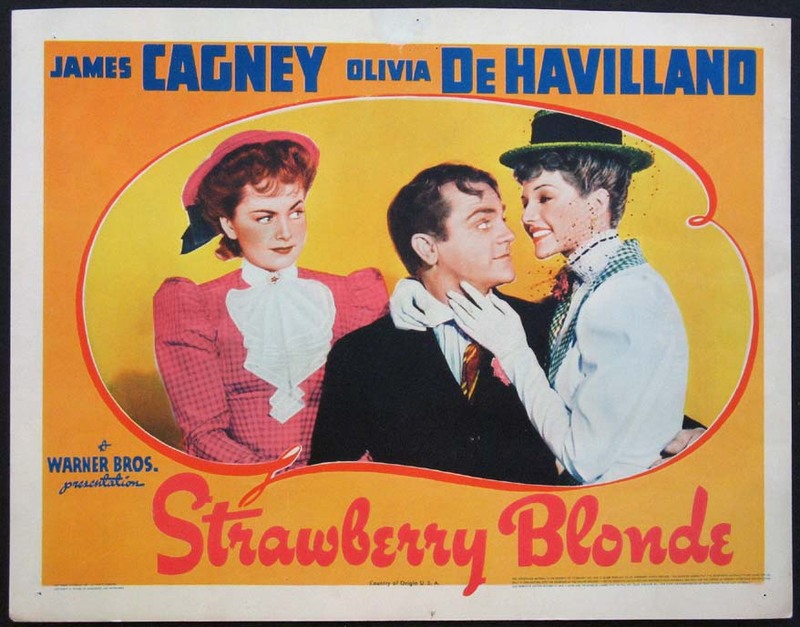 The Strawberry Blonde had already been filmed less successfully in 1933 with Gary Cooper in the lead role. 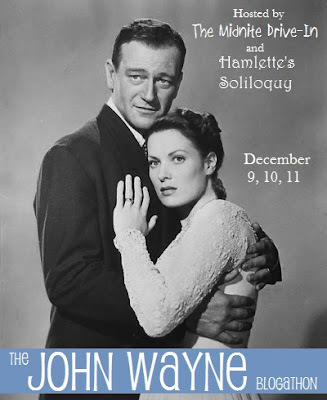 It originated as a successful play called One Sunday Afternoon with Lloyd Nolan in the lead role. I would assume Nolan lost out to Cooper due to star power that would be needed for the screen adaptation. Walsh would actually direct another version of the script in 1948 under the original title with Dennis Morgan in the lead role and Dorothy Malone taking on Olivia’s character. Walsh did the same with his other 1941 release High Sierra. He would redo that as a western in 1949 under the title Colorado Territory. This take on the play from James Hagan is easily the best of the bunch and other then the black and white photography should be considered a first rate production with an outstanding cast from Cagney and Olivia on down to Hale who has always been one of my favorite Warner Brothers contract players and the other studio regulars. My intention is not to demean the black and white photography from James Wong Howe, it’s just as if it’s begging to be seen in color. The beauty of Olivia and Rita practically demand it. Thankfully this turns up on TCM occasionally and when Warner’s Archive put it out I quickly secured a copy for my shelf. Enjoyable studio era production and highly recommended! Now please head over to Kristina’s, a girl practically living next door to me! 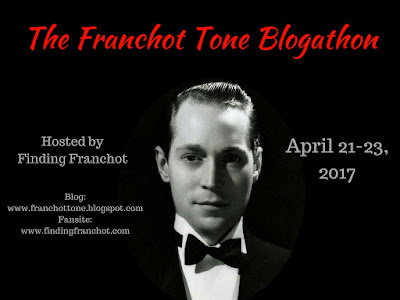 Her Speakeasy site also had an Olivia film on tap from the forties and features a top flight cast joining her for some college hi-jinks. Yes this is a delightful movie with such a nice combo of actors. On a tangent it’s a fun fact to read how Walsh “remade” those two of his own movies, and he wasn’t the only one. Would be interesting to see today. This movie is one that I just go on about after rewatching it. Loved it since the first viewing years ago. It would be fun to see a director redo something from our era. How about Scorsese redoing one of his early low budget efforts like Mean Streets. Spielberg giving us the all new Duel. It’s a long time since I saw this film – I caught it once during a Cagney season on TV in the early 80s. That’s a good many years now but I still remember it, and rememeber enjoying it. My first viewing was probably about the same time and I was captivated by Olivia in this one. 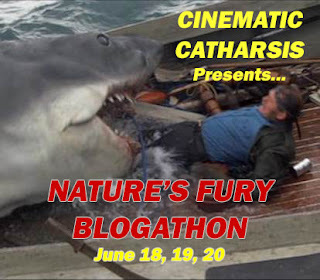 Makes for a fun revisit and Alan Hale worth every minute.